In Chase the Ace, players get to experience the thrill of winning or the sore agony of loosing it all if the numbers aren't in their favor. In this game the kings are high and aces are low. Three counters for each player. This could be any object such as paperclips or pennies perhaps even pieces of candy. Poker chips also work well. A table or other flat surface with enough seating for all players. Players each draw a card from the deck. 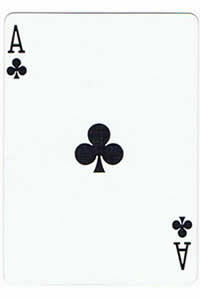 The player with the highest card is the dealer. The dealer then deals out one card to each player. Each player looks at their card and determines whether or not they want to keep it. The player to the left of the dealer starts by saying "stand" if they want to keep the card or "change" if they want to get rid of it. If the player decides to change the card they slide it face down to the player to their left. That player must then exchange cards with the player wanting to change unless they have a king. If they have a king they lay the king down face up and show the rest of the players as proof. Having the king makes them immune for that round. If this happens the player must then move onto the next player to the left and exchange cards with them. The big gamble comes in when changing a card. Unless you are wanting to change an ace you always run the risk of changing for a lower card. After the exchange has taken place the player who was forced to trade looks a their card. They then decide if they want to stand or change with the player to their left. Play continues as such until it reaches back to the dealer. If the dealer wants to exchange cards they place theirs at the bottom of the deck and draw the top card. Once play has made it back to the dealer all players lay their card down face up for all to see. The player with the lowest card places one of their counters into the pot. If more than one player has the lowest card, each player with the low card must place a counter into the pot. The cards are collected and added to the bottom of the deck and the dealer deals each player a new card. Once a player loses all their counters they are out of the game. The player in the end with a remaining counter is the winner.